Half-naked men crash into each other at this festival! You must see the gorgeous Yatai Procession too! 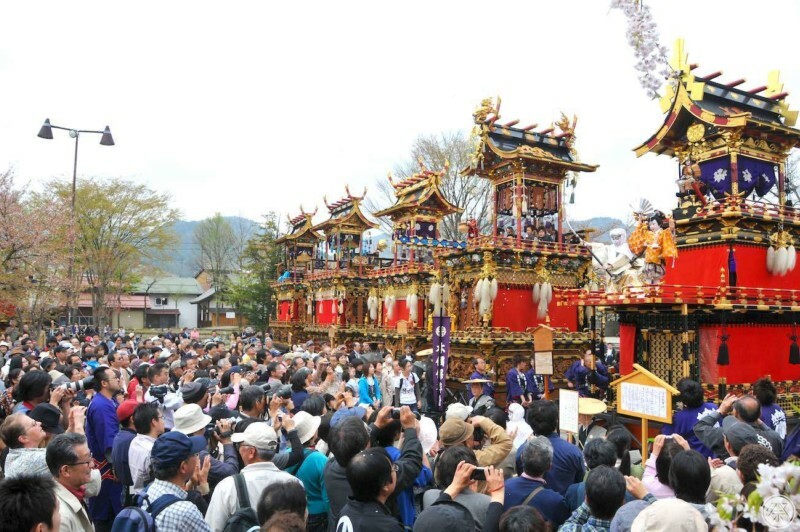 The Furukawa Matsuri is the another name for the annual Spring festival of the Ketawakamiya Shrine in Hida City, Gifu Prefecture. 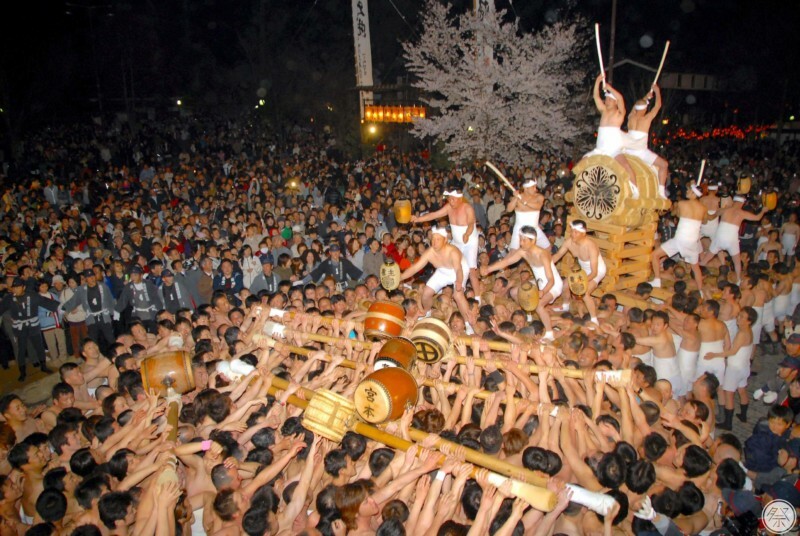 It is made up of two main events: the exciting clashing of half-naked men and drums called the Okoshi Daiko, and the gorgeous Yatai float procession. At the Okoshi Daiko, local men wearing traditional white wraps called Sarashi gather by the hundreds. The main drum, a giant on a raised platform, is followed by smaller drums called Tsukedaiko representing different town boroughs which are rammed into each other as part of the festivities. 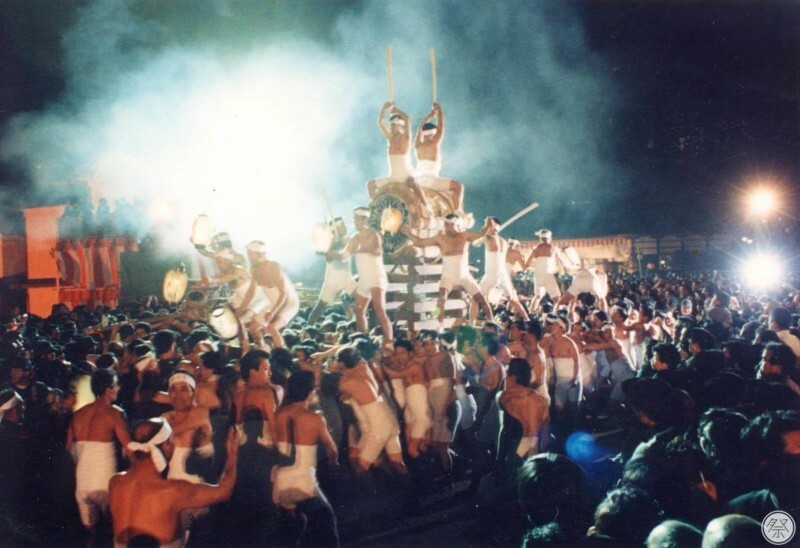 To the local men of the Hida region, being one of the two drummers that straddle the giant drum is the biggest honor as a citizen and fills others with envy. These unyielding and courageous Hida Furukawa locals suited up in the festival attire are referred to as "Furukawa Yancha." The battle of offense and defense that unfolds at the Okoshi Daiko can often be dangerous. Come absorb yourself in this festival's passion and cheers. 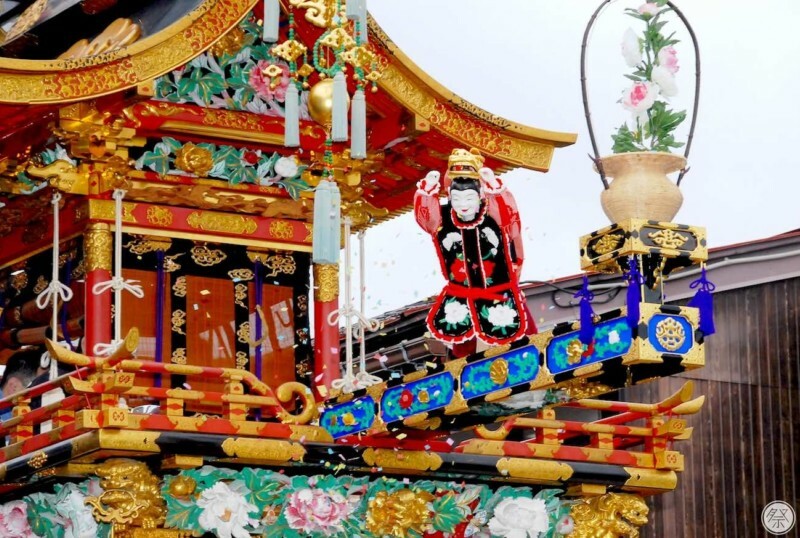 On the next morning, as if it were a completely different festival, nine gorgeous festival Yatai floats are paraded around the town for an elegant and beautiful display of what could be the furthest thing from a physical battle. In 2016, the Furukawa Matsuri was listed as a Unesco intangible cultural asset. This festival, the pride of Hida Furukawa, is sure to stay passed on from generation to generation as a traditional culture of global value. 1．Watch the heated battle of Okoshi Daiko! The Okoshi Daiko is a battle over position, by one giant drum and twelve smaller Tsuke Daiko drums representing the different boroughs of town that clash while following it. The Tsuke Daiko drums are tied to round logs that try to stay close behind the giant that rests upon a raised platform called Yagura. Keeping position right behind the main drum is seen as an honor. Tsuke drums ("tsuke" meaning to "stick to") shooting out from side streets and alleyways in a dash towards the best position are warded off by the giant drum defense team, filling the entire town streets in heated frenzy that goes on past midnight. 2．Watch the astonishing Yatai float procession. In the morning of the second day (20th), there is a gorgeous and extravagant float parade. 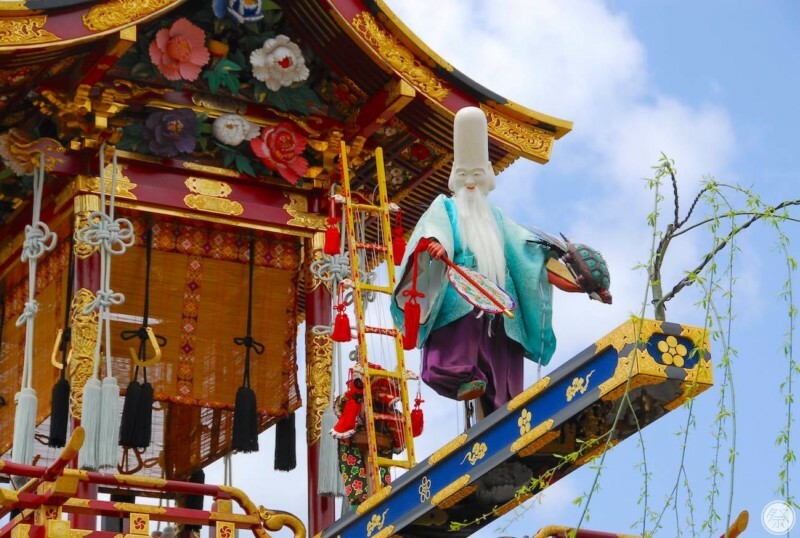 There are nine yatai floats in total, made by the hand of Hida’s master craftsmen, that proceed in line throughout the streets of town for an overwhelming spectacle. Take your time inspecting the delicate carvings. Two of the floats feature performances by traditional mechanical puppets called Karakuri Ningyo. These puppets are powered not by electricity, but by strings and cogs. Come see the amazing performance of these elaborately designed figurines. 3．Watch the amazing children Kabuki. On one of the nine floats, there is a special Kabuki service performed by children. The play, Benkei and Ushiwakamaru. Benkei, the large man known for his strength, tries to steal the sword off of the young Ushiwakamaru who crosses his bridge one day. Benkei, however, is at the mercy of the light and nimble Ushiwakamaru who swiftly dodges all attempts. Benkei admits defeat and vows his loyalty to Ushiwakamaru. The child Kabuki play is based on this famous Japanese story. You really must the talent of these bold child actors. *No cancelation due to rain other than possible certain portable shrines and floats. 8:00~4:00 Each city borough puts on several services of child Kabuki and Karakuri Ningyo. 8:00pm Okoshi Daiko Departure Ceremony, or Shuttatsusai. 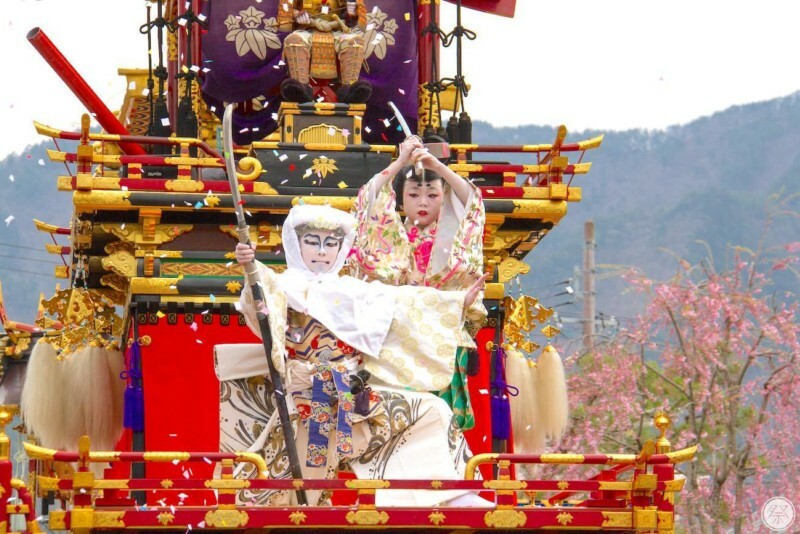 9:00 ~ 10:00am The Child Kabuki and Karakuri Ningyo performance is held in the Square. 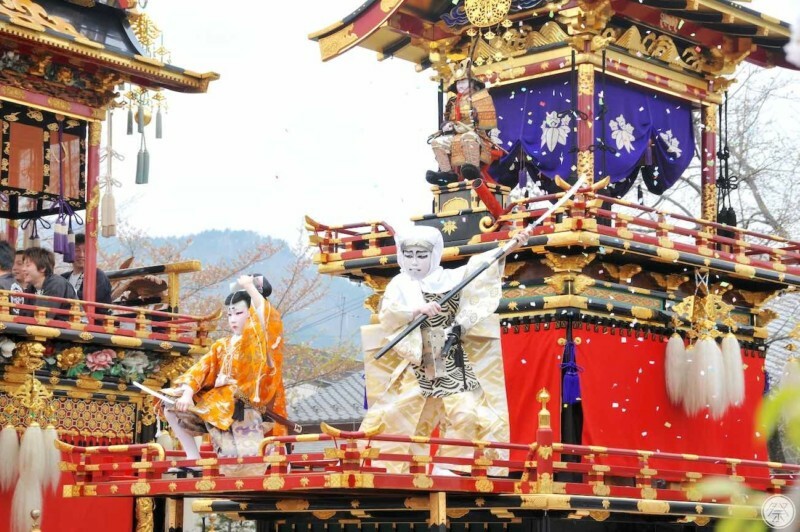 12:30 ~2:00pm The Child Kabuki and Karakuri Ningyo performance is held by the Shinshu-ji Temple. *The timetable may change due to weather. Information on the days events are available at tourist information counters. Place Around town in the Furukawa section of Hida City. International Reception and Info. Information in foreign languages are offered at information centers. English and Chinese pamphlets are available. Wi-Fi Wi-Fi is available in some places, including the waiting room next to Hida-Furukawa Station, the Machinaka Tourist Information Office, and some locations along the Setogawa river (signs shown). Since there are many people during the Okoshi Daiko, please be careful not to be pushed into danger, for example ditches along the road.